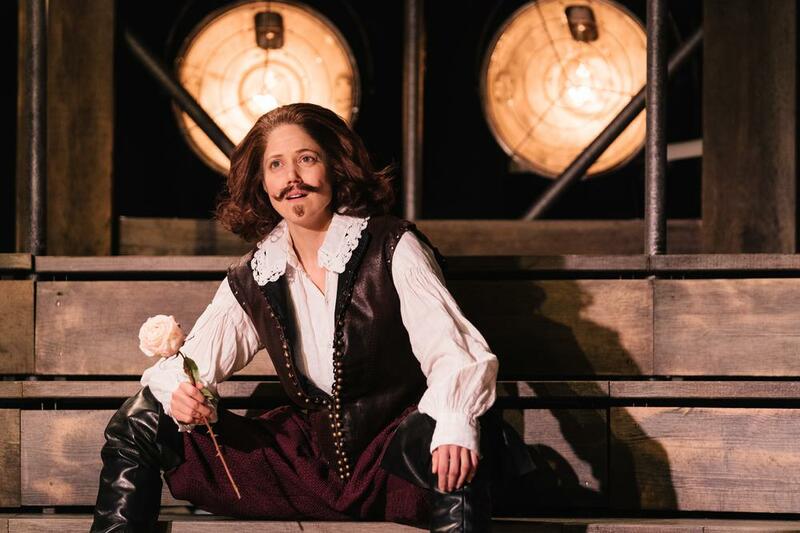 “Search for this and you won’t find it,” is one of the refrains of Emilia, Morgan Lloyd Malcolm’s gloriously enjoyable comedy which celebrates the late Elizabethan poet Emilia Bassano. Emilia operates as a fierce lament for all the other forgotten women writers whose names have been erased from history. Not just those in the distant past. In almost every fierce moment it also reminds us of all the opportunities lost; all the plays that have gone unproduced, both back then and far more recently, as men have dominated our stages. Here the stage is being taken back. “We are only as powerful as the stories we tell,” says Emilia. 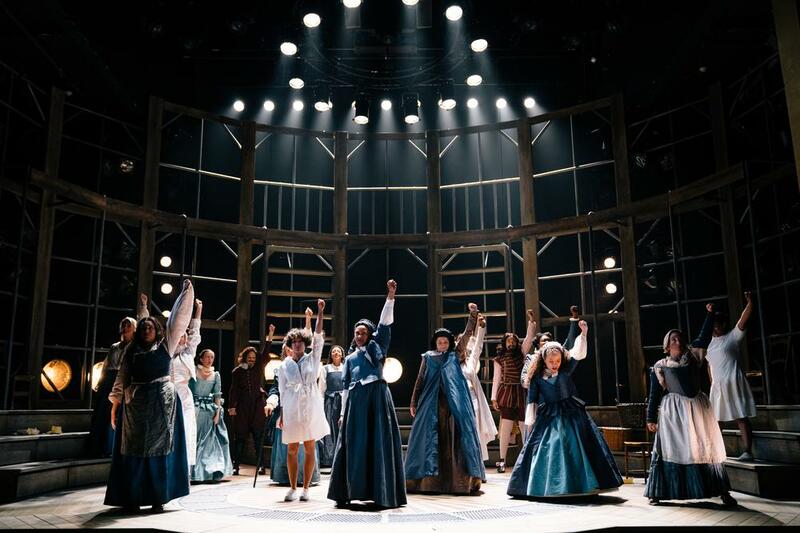 This all-female production, directed with real grace and invention by Nicole Charles and performed by a crack ensemble, also reminds the who does the telling is crucial too. Emilia is rescued from the shadows where she has languished only as a possible contender as the “dark lady” of Shakespeare’s sonnets and instead claims her own story. Even as a very young woman at court we watch as, unlike her giggling contemporaries, she refuses to be acted upon and instead takes action to secure her future. 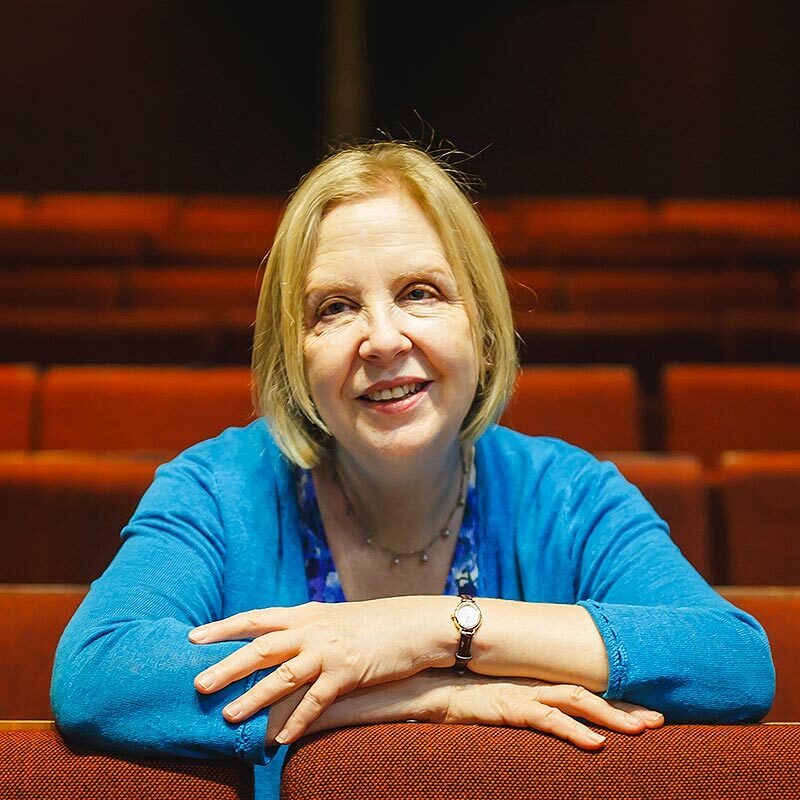 It’s no surprise that Lloyd Malcolm gives us not just one Emilia but three—Saffron Coomber, Adelle Leonce and Clare Perkins—because the great trick of the play is the way that it operates as a series of echoes so that while the multi-facetted Emilia is sharply defined she also stands in for all the other lost women of history. She is all the women burned as witches—as one is here—she is all the women beaten by their husbands—as one is here—she is all the women who have ever given birth and looked at their tiny daughters and determined they will have a better and different life than their mother. Saffron Coomber, Adelle Leonce and Clare Perkins as Emilia. Originally produced at the Globe last summer, this West End transfer refuses to just sit demurely on the stage, but riotously claims the space spilling out into the auditorium as if the ferocious energy of something long pent up and needing release can no longer be contained. It is like a mighty theatrical wind gathering up all in its skirts. By the end it’s not just the cast, but the audience who are raising the roof for this exuberant mish-mash which is part biography, part fantasy, part tragedy and part pantomime which rewrites the history told by men. It turns out that Will Shakespeare was a bit of plagiarist, and he definitely had a very dodgy moustache. Charity Wakefield as William Shakespeare. The good humour and buffoonery never suffocates the show, and in taking the very little that we know of Bassano’s life and re-imagining it Lloyd Malcolm not only gives her the due owed and briefly lets her live again, but also reminds us that words are power. They can be dangerous and women take a risk when they use them. But many, like Bassano, refuse to be silenced. 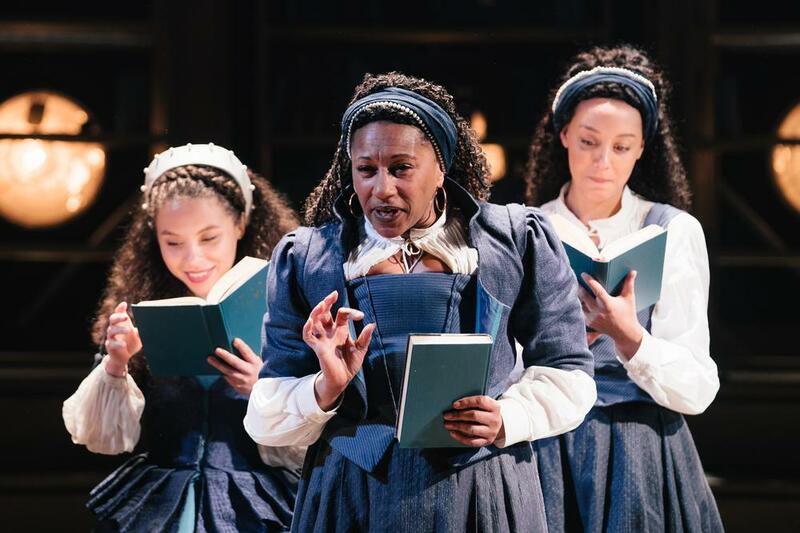 Emilia runs at the Vaudeville Theatre until Saturday 15 June. You can find tickets here.